You can create workouts on iPod nano to reach tness goals of distance, time, or calories burned. a record of all your workout data, which you can upload to the Nike+ website if you wish. 1 On the Home screen, tap Fitness. 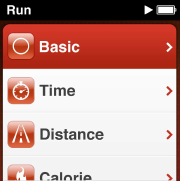 2 Tap Run, and then tap one of the workout types (Basic, Time, Distance, or Calorie). 3 Tap a preset goal, or tap Custom. 4 Choose the audio content you want to listen to during your workout. your Daily Step Goal total. Workouts you create on iPod nano are saved so you can use them again. 1 On the Home screen, tap Fitness, and then tap Run. 2 Flick up, and tap My Workouts. 3 Tap a saved workout, and then tap Start Workout. with a remote, you can control your workout with the remote.